What does it mean to repurpose something? Upcycle? 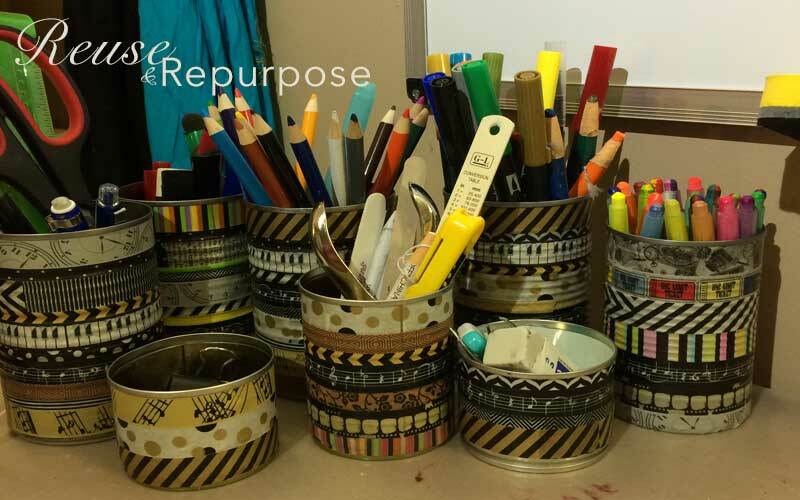 Repurposing something is where you take an object, in this case tin cans, that would go in the trash or recycle bin and give it a new purpose. That’s also called Upcycling. Being a creative person, I’m always on the hunt for new creative projects. I’m also a bag lady. Those that shop with me know that I have a bin in the back end of my car full of all sorts of shopping bags. I also recycle diligently. I bought some Washi Tape while shopping with a friend who was into scrapbooking. Can’t even remember what I bought it for, but I did. It sat in a craft box for a long time until I started doing bullet journaling. Then, one lazy Sunday morning, on my first cup of coffee, I saw P Allen Smith talk about some of the cans he had done. They were much fancier and more work than mine here. But, it did inspire me. I now have 2-3 times more Washi Tape than I had before. Some are more colorful, but I’m really like this color scheme the best. I have cans all over the house and use them in my art studio. Go be creative and enjoy!